Perfect inlet for greenhouses, garages or any area that needs ventilation. Shutter size indicates the size of the opening, rough opening size for mounting will be a half an inch larger (ie. 12" Square rough opening would be 12.5" square). The outer flange of the shutter that mounts to the wall will be 1.5" larger than shutter size. (ie. 12" square shutter, flange will actually be 13.5" square) Depth of the shutter is 2". 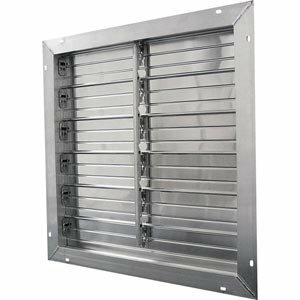 Optional motorized kit available for the shutters but not included (SH1019).